Home » Uncategorized » Buy Immupharma (IMM) says VectorVest. This pharma stock still offers further upside for the adventurous investor. 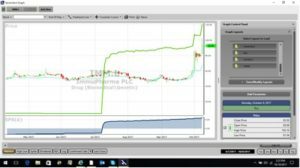 Buy Immupharma (IMM) says VectorVest. This pharma stock still offers further upside for the adventurous investor. By Alan Green in Uncategorized, VectorVest on 10th October 2017 . AIM listed ImmuPharma (IMM.L) is a drug discovery and development company. The London-based Company is focused on the development of drugs, primarily based on peptide therapeutics, to treat serious medical conditions such as autoimmune diseases. IMM has approximately five drug candidates in development, over two platform technologies and approximately 70 patents. Lupuzor is the Company’s drug candidate and is a treatment for lupus, and life threatening auto immune disease. IMM’s cancer treatment, IPP-204106, has completed a Phase I/IIa study in cancer patients in France. Its compound IPP-102199 for pain relief is designed as a non-addictive replacement for morphine and other opioids, and is in pre-clinical development. Its treatment for inflammatory and allergic disorders (IPP-201007) is in early stage development. Its compound IPP-203101 is an antibiotic against methicillin-resistant staphylococcus aureus (MRSA) and other infections. The Company’s research operations are in France. On September 27th 2017, IMM reported interim results, recording a reduced interim loss of £3m for the half year to June 30. Following a successful £4.1m fundraising in March 2017, IMM now has net assets of £6.4m, up from £5.5m at 31 Dec 2016. The company said that all patients in its Lupuzor study had “now passed the six months stage, with over 26% of patients having now completed the full 12 months.” Subject to approval by the US Food and Drug Administration (FDA) and the European Medicines Agency (EMA), Immupharma is now planning ahead in anticipation of the trial’s successful outcome and expects to have the first set of batches ready by the end of Q1 2018. IMM sees a number of routes to market for Lupuzor, which could include a global licensing deal. Although the IMM share price exploded higher in late September, VectorVest stock graph analysis logged growth in the GRT (Earnings Growth Rate) in mid June, when the shares were trading around 50p. Despite climbing to 93p, IMM still retains a forecasted GRT of 33%, which VectorVest considers to be excellent. Traders should note that the RS (Relative Safety) metric records a fair rating of 0.90 on a scale of 0.00 to 2.00, but with a current VectorVest valuation of 120p per share, in the run up to commercialisation of Lupuzor, IMM shares remain undervalued. The chart of IMM is shown above in my normal format. Earnings per share (EPS) are shown in the window below the price. The rapid rise of EPS in July 2017 and the resultant revaluation of IMM.L gave 2 ½ months warning of the breakout in price. Remember EPS growth is the engine that drives the share price. From the 2nd to the 6th of October 2017 the advance in price consolidated prior to a break upwards on the 9th October 2017. The probabilities favour this to continue to the VectorVest valuation. Summary: From time to time the pharmaceutical sector can provide stellar returns, as small pharma companies either bring a groundbreaking drug to market or are acquired by global drug giants. 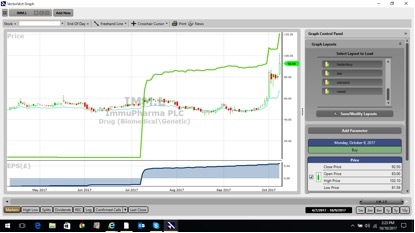 IMM looks to be close to completing the former with Lupuzor, and with a number of other drug candidates in development and a raft of patents, the stock does still appear to offer further upside for the adventurous investor. Speculative buy. Readers can examine trading opportunities on IMM and a host of other similar stocks for a single payment of £5.95. This gives access to the VectorVest Risk Free 5-week trial, where members enjoy unlimited access to VectorVest UK & U.S., plus VectorVest University for on-demand strategies and training. Link here to view.